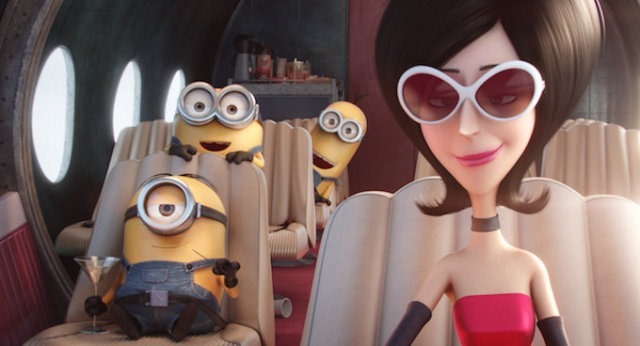 It has to be said, those little yellow guys from the Despicable Me movies have become a runaway merchandising goldmine, and so following their slapstick pratfalls in those two highly entertaining outings … getting their own movie was an obvious no brainer. Kevin, Bob and Stuart are members of a tribe of ‘minions’; peculiar little guys born to serve an evil villain. However after centuries of missteps and blunders in search of their perfect leader, the three friends are given the task of setting off on a journey to track down famed super villain Scarlett Overkill, who just so happens to be attending a villain convention in Orlando. It’s silly stuff no doubt, but packed with energy and plenty of in-jokes and site gags. The minions are endlessly appealing and watching them get into scrapes is a lot of fun. One stand out chase involving The Queen and The Crown Jewels is hilariously gripping. However the villain, despite best efforts from Sandra Bullock is tiresome and clichéd and brings very little to the admittedly wafer-thin story. Her henchman is also pretty lame. The constant mickey taking of Brirish stereotypes got old quickly too. But that being said, with uniformally ‘gorgeous’ CGI animation (sorry, but give me hand drawn animation any day of the week over such ‘pristine’ pixels) and bags of personality in the little fellas – I still got a kick out of this. Does it do much I wasn’t expecting? No. But did it entertain? Certainly. This entry was posted in Animation, Blu-Ray, Comedy Reviews, Movies, Reviews and tagged Despicable Me, Illumination Entertainment, John Hamm, Michael Keaton, Minions, Sandra Bullock by Craig M. Bookmark the permalink. Good review! As adorable as these little guys are, I’m wondering if they have enough to sustain my interest for the course of a feature film. My initial thoughts exactly…the movie is a lot of fun, so worth checking out for sure…but far from a classic due to the simplicity of the story and characters.